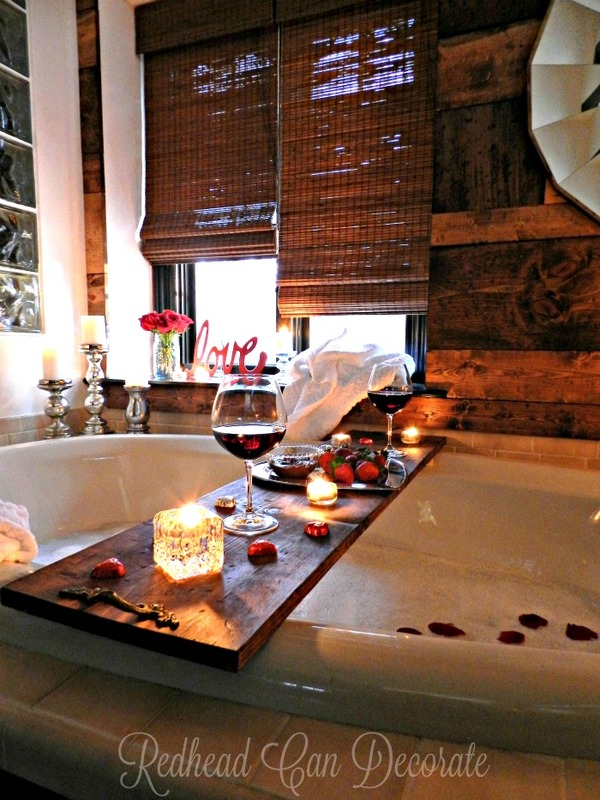 YOU: “A ‘Romantic Bathroom Date’? I mean really, Julie. Is this really necessary? Are you really going there??? You’ve already showed us your “DIY Wood Planked Wall” tutorial, and your “Romantic Master Bedroom“, how much more are you going to share? He loves me, he loves chocolate, so…why not, right? I mean, we have this huge jacuzzi tub that gathers laundry and dust. It’s time to relax, and enjoy the fruits of our labor…or maybe just soak our aching muscles in the hot tub, drink wine, and eat chocolate dipped strawberries. It is Valentine’s Day weekend after all. Did it just get darker in here, or is it because I sniffed the wine? All kidding aside…Valentine’s Day comes at the coldest part of the year. Do you think that is by coincidence? I don’t think so. You’re supposed to get all cozy and warm with your lover. 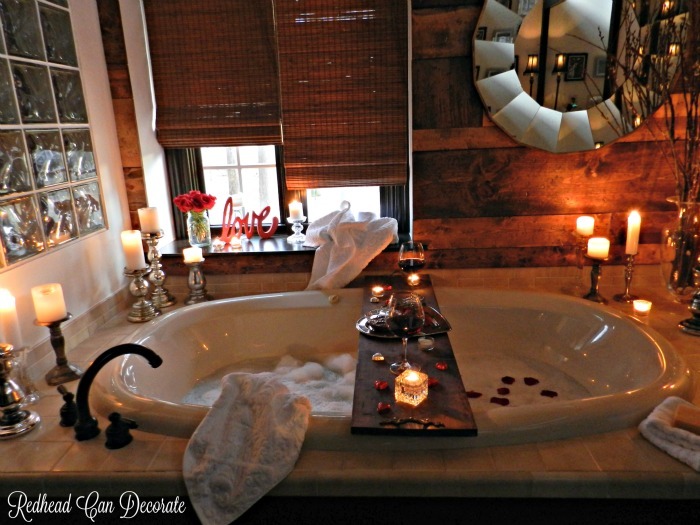 What better way than to set up a “Romantic Bathroom Date”. You don’t need a big jacuzzi like this. You can use any tub. 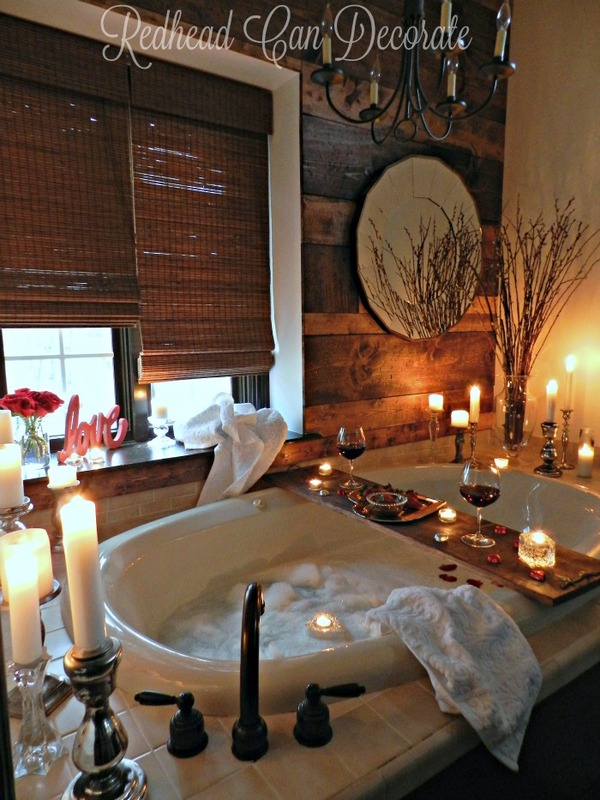 Just fill it up, add tons of bubbles, a “love sign” (I spray painted mine red), a few candles, cozy towels, and make a tray full of special treats. If you like coffee, set up a coffee bar. If you like cookies, bring on the milk. The idea here is to spend some time together, even if it is in the “BATHROOM”. This beats going out in the cold, waiting in line to eat an expensive dinner next to Joe Shmo, and is so much more romantic. To be honest… it’s easier. You could even order in and have this as the dessert. If you’re interested in making a “DIY Tub Tray”, it is one of the simplest projects I’ve ever done. We had the board left over from the “DIY Planked Wall”, however if you don’t, all you need is a pine board from your local lumber supplier. Measure the width of your tub to see how long you would need it to be. After you get it home, beat it up with a hammer or chain, and then stain it. 2 coats of polyurethane after the stain is dry will seal it nicely. Then hammer in some handles. Done. I’m keeping our “DIY Wood Bathroom Tray” on our tub even when it’s not in use. I have some magazines and candles on it. Hey, you could use it on your bed or floor, too. What do you think? 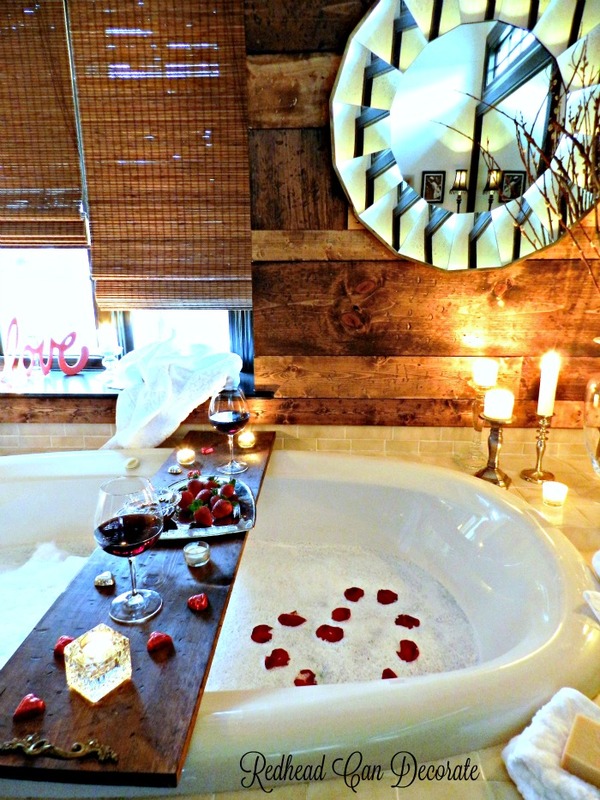 Would you ever plan something like this for your lover? If you do, just remember to shut the blinds. Now, get out. I just heard the garage door open! Paige, u r hilarious, u stalker. I love your home…so I guess that makes 2 stalkers. Simply gorgeous!!! Love all your designs & don’t think they’re limited to Midwest. I believe your work is without boundaries!!! Outstanding!!!! Thanks for the inspiration!!! One of the nicest compliments I have ever received, thank you, Suellis! How beautiful. How inviting. You romantic soul ! You have a very fortunate husband. Julie, love your style! We always spend VD at home, rather than fight the crowds and pay exorbitant prices. And this is the perfect nightcap or dessert. Thank you for a wonderfully romantic and easy idea. Hugs and kisses! That is SO beautiful! I love every detail you put into this…not too much and just enough. 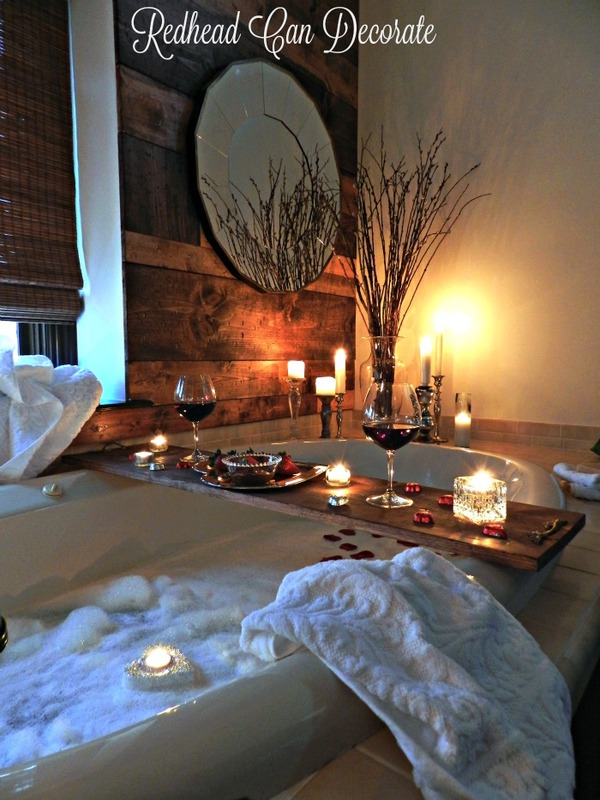 I love the ruggedness of the wall and the softness of the candles…great juxtaposition. Did you make the tray going across the tub? If so, I like the accents you put on both ends. Nice touch. 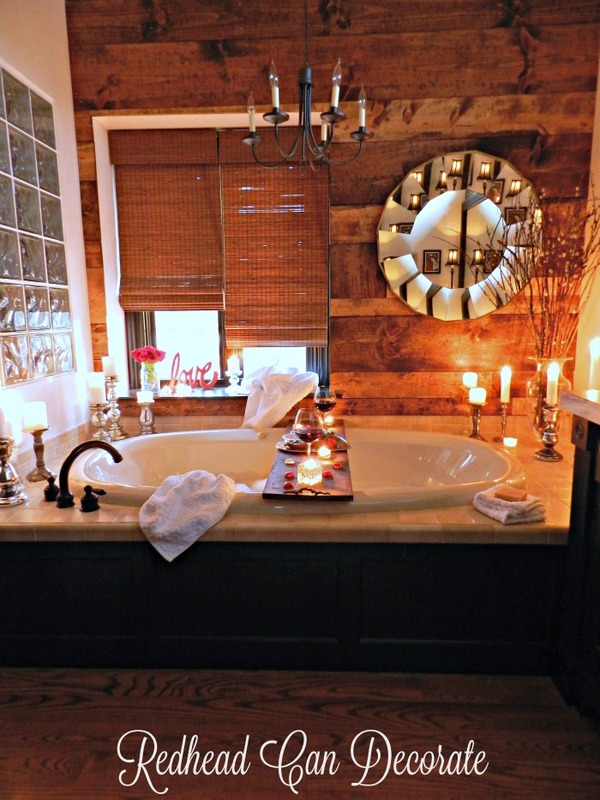 Now I want to redo my bathroom! Your bathroom is gorgeous. Such a relaxing sanctuary. I’d never be out of there! Love love the bathroom!! What is on the other side of the glass block wall? A shower or closet?